Perennial herb from a deep taproot and woody stem-base; stems ascending, few to several, densely glandular and sparsely long-hairy, 0.2-1.0 m tall. Basal leaves long-stalked, the blades mostly triangular, 10-50 cm long, 10-20 cm wide, green, inconspicuously stiff-hairy and often glandular, prominently nerved, round-toothed; stem leaves few, lanceolate to linear, greatly reduced. Heads with ray and disk flowers, 1-4, the disk 2.5 cm or more, the lateral heads smaller; involucral bracts lanceolate to oblong-lanceolate, slightly woolly, the outer ones 1-4 cm long and herbaceous, exceeding the inner ones; ray flowers 13 or 21 in a terminal head, yellow, 2-3 cm long; disk flowers 5-7 mm long, yellow. Dry grassy areas and rocky, open woodlands in the lowland zone; rare on SE Vancouver Island; S to CA. In British Columbia there are no look-alikes. 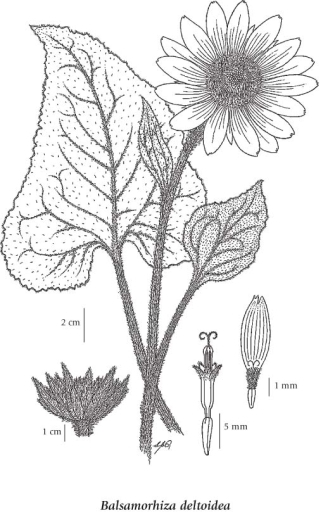 A related species, Balsamorhiza sagittata, is restricted to the BC mainland east of the Coast Mountains / Cascades chain.